Preheat your oven to 350 degrees. Coat a six cup muffin pan with nonstick cooking spray. Whisk together the eggs, half and half and salt in a medium bowl, then evenly distribute the egg mixture among the muffin cups. Add about 2 tablespoons of diced veggies mix ins to each cup. 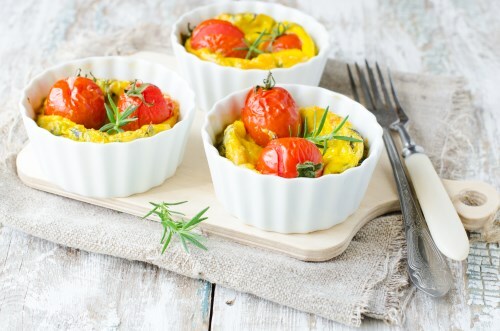 Bake the omelets until they are puffy and the edges are golden brown, about 20 – 25 minutes. If necessary run a butter knife around the edge of each one of the omelets to loosen them before removing them from the pan.